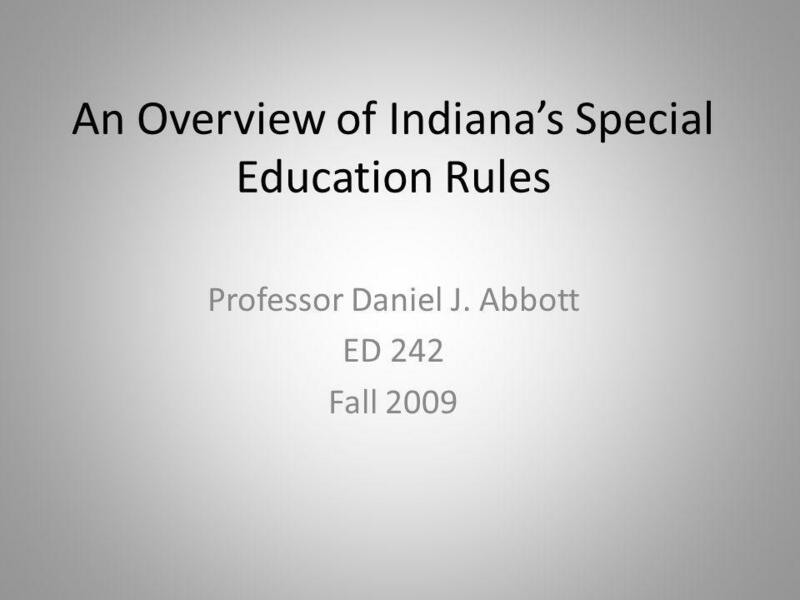 An Overview of Indianas Special Education Rules Professor Daniel J. Abbott ED 242 Fall 2009. 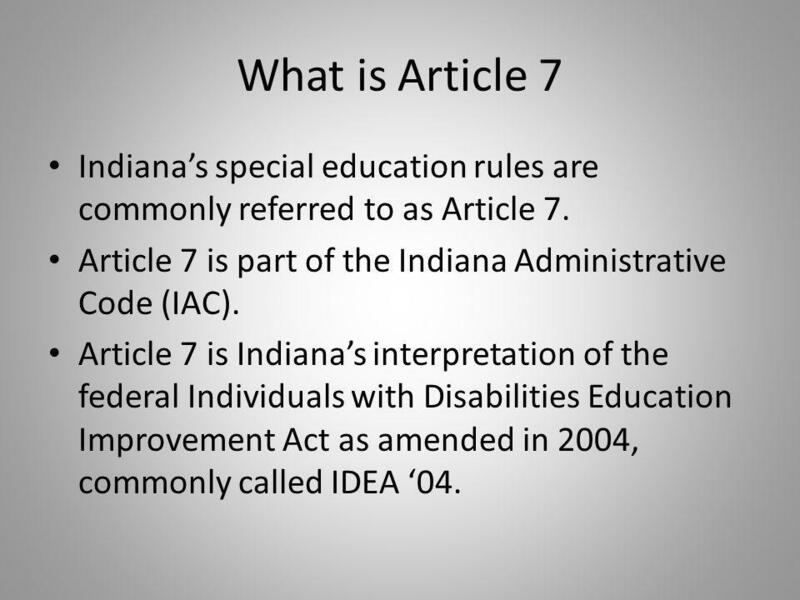 2 What is Article 7 Indianas special education rules are commonly referred to as Article 7.  Article 7 is part of the Indiana Administrative Code (IAC). Article 7 is Indianas interpretation of the federal Individuals with Disabilities Education Improvement Act as amended in 2004, commonly called IDEA 04. 4 Within Article 7 The process for parent(s) and school personnel use in making educational decisions and developing the students individualized education program (IEP). 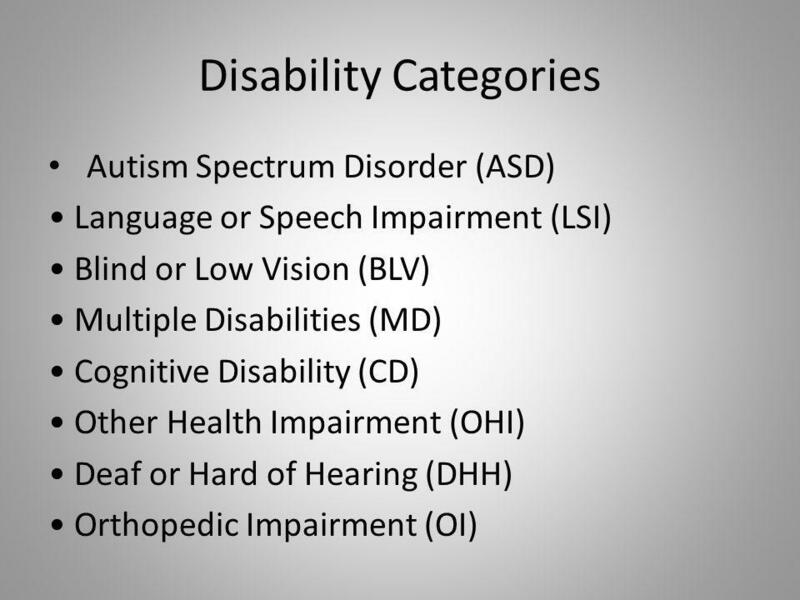 Definitions of and disability categories, and professionals required to participate in Case Conference Committee (CCC)meetings. 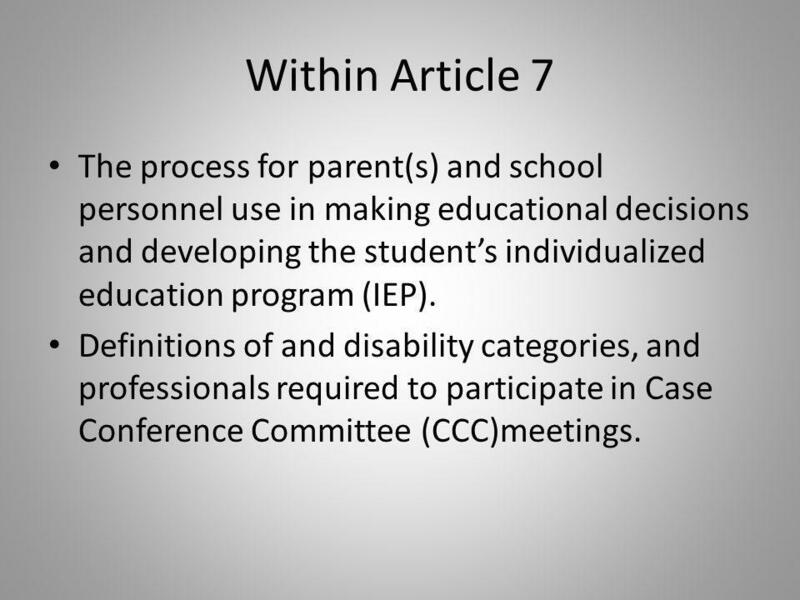 7 Case Conference Committee (CCC) The CCC determines eligibility for special education and/or related services. 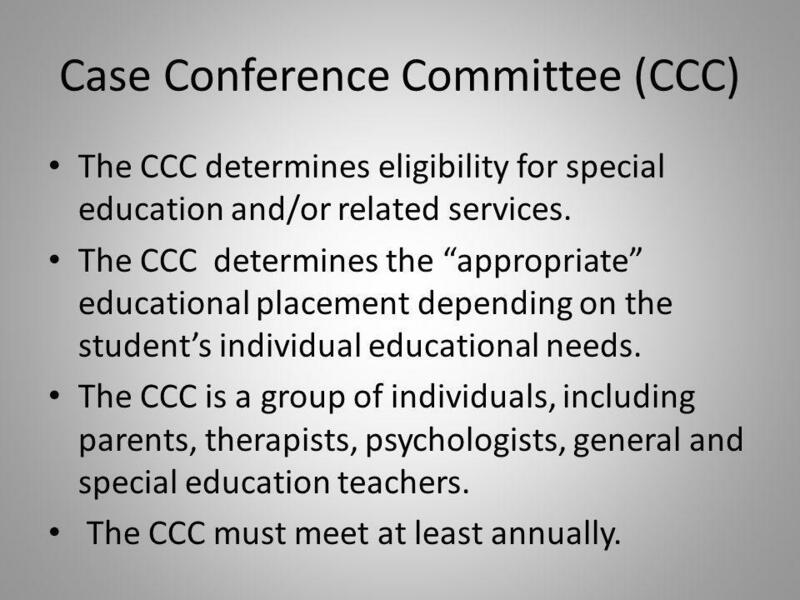 The CCC determines the appropriate educational placement depending on the students individual educational needs. The CCC is a group of individuals, including parents, therapists, psychologists, general and special education teachers. The CCC must meet at least annually. 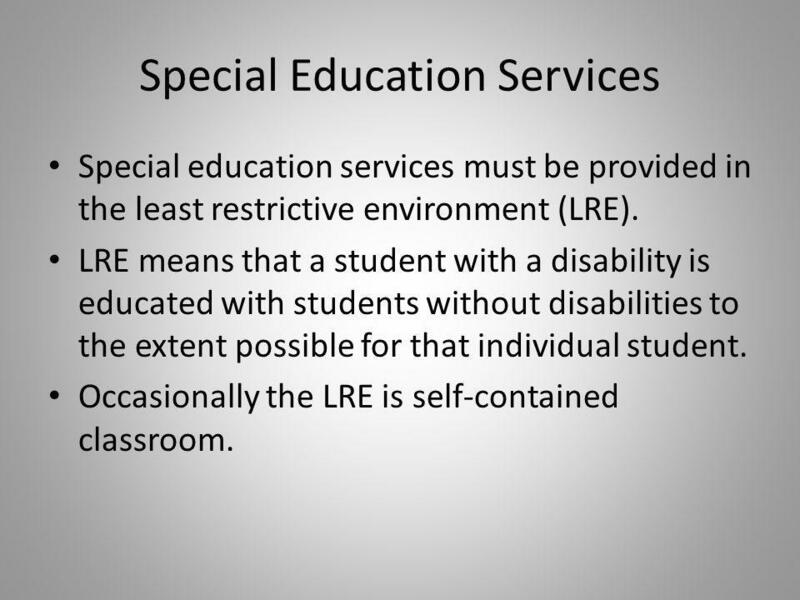 8 Special Education Services Special education services must be provided in the least restrictive environment (LRE). LRE means that a student with a disability is educated with students without disabilities to the extent possible for that individual student. Occasionally the LRE is self-contained classroom. 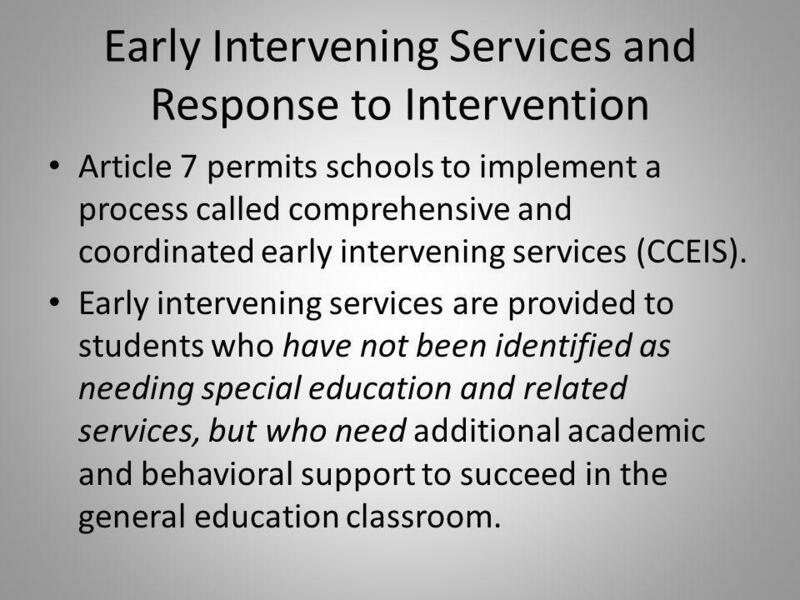 9 Early Intervening Services and Response to Intervention Article 7 permits schools to implement a process called comprehensive and coordinated early intervening services (CCEIS). Early intervening services are provided to students who have not been identified as needing special education and related services, but who need additional academic and behavioral support to succeed in the general education classroom. 10 Response to Intervention As part of early intervening services, many schools are utilizing a systematic process referred to as response to intervention (RtI). The RtI process utilizes screening and periodic monitoring of progress of all students. 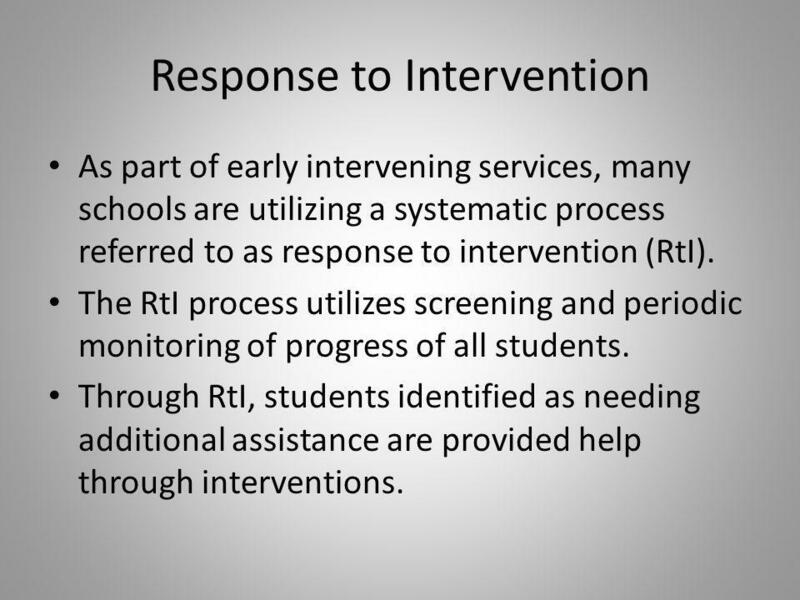 Through RtI, students identified as needing additional assistance are provided help through interventions. 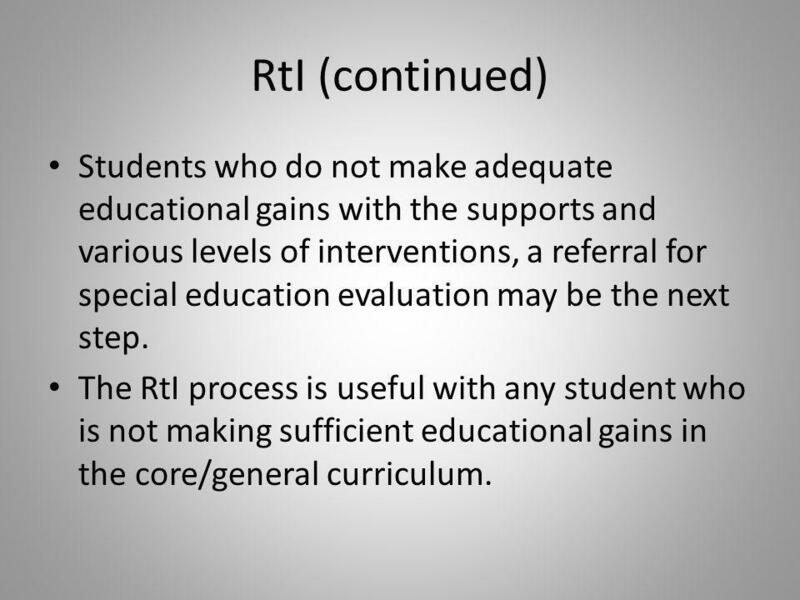 11 RtI (continued) Students who do not make adequate educational gains with the supports and various levels of interventions, a referral for special education evaluation may be the next step. The RtI process is useful with any student who is not making sufficient educational gains in the core/general curriculum. 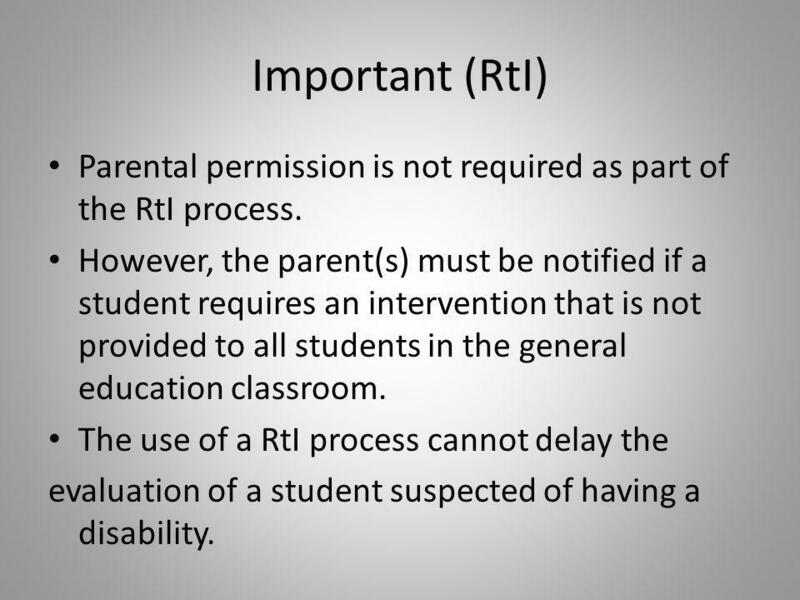 12 Important (RtI) Parental permission is not required as part of the RtI process. However, the parent(s) must be notified if a student requires an intervention that is not provided to all students in the general education classroom. The use of a RtI process cannot delay the evaluation of a student suspected of having a disability. 13 Accommodation vs. 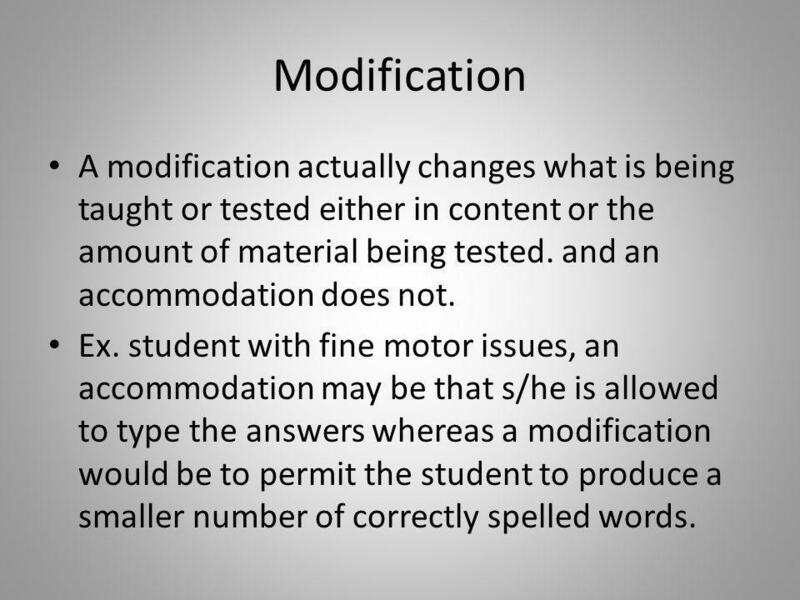 Modification Accommodations level the playing field without changing what is being taught or tested. 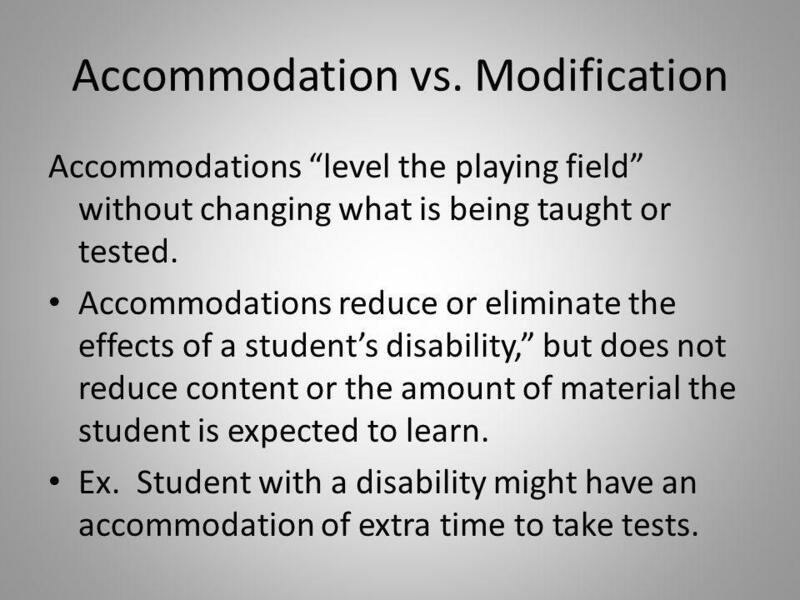 Accommodations reduce or eliminate the effects of a students disability, but does not reduce content or the amount of material the student is expected to learn. Ex. Student with a disability might have an accommodation of extra time to take tests. 14 Modification A modification actually changes what is being taught or tested either in content or the amount of material being tested. and an accommodation does not. Ex. student with fine motor issues, an accommodation may be that s/he is allowed to type the answers whereas a modification would be to permit the student to produce a smaller number of correctly spelled words. 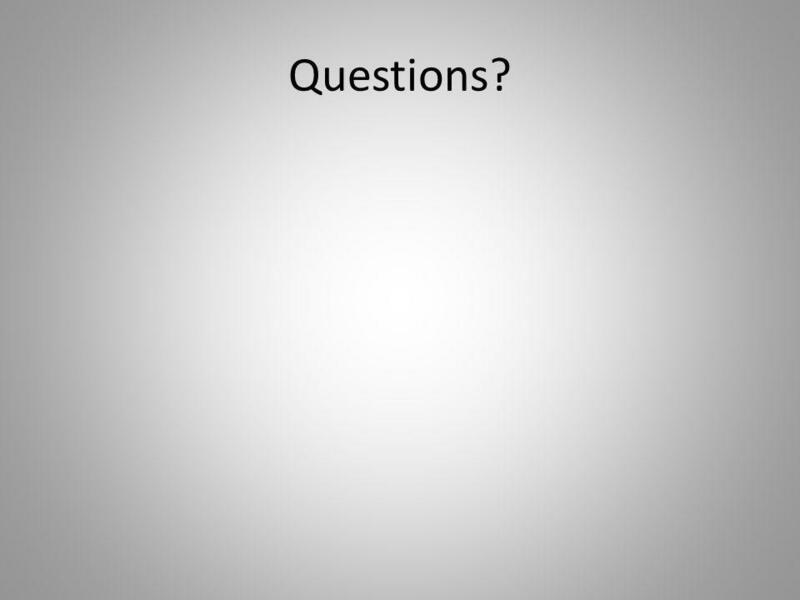 Download ppt "An Overview of Indianas Special Education Rules Professor Daniel J. Abbott ED 242 Fall 2009." 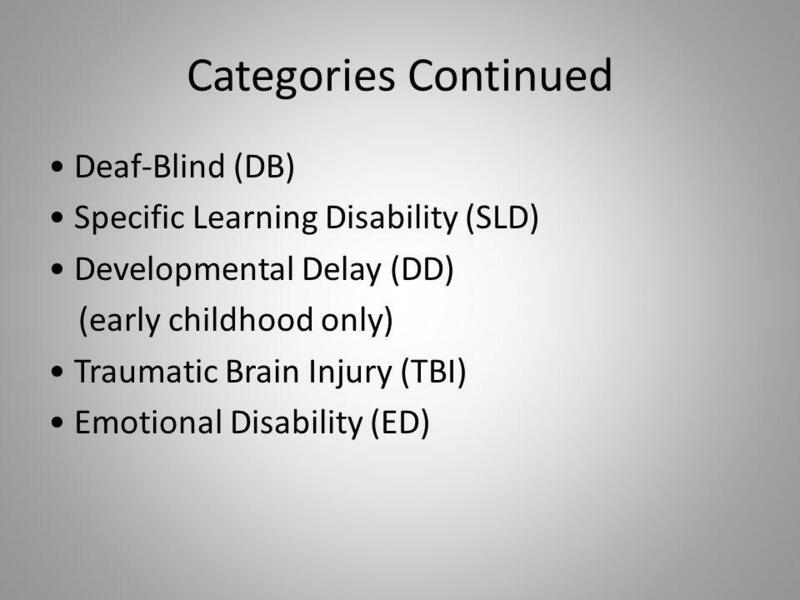 DEPARTMENT OF SPECIAL SERVICES PROJECTIONS PREPARED BY KIM CULKIN, DIRECTOR OF SPECIAL SERVICES MARCH 2013. Definitions, History and Legislation for Change Individuals with disabilities are restricted by access, opportunity and attitudes. Special Education Referral and Evaluation Process Presented by Lexington Special Education Staff February 1, 2013. Understanding Special Education services SPECIAL EDUCATION REFERRAL PROCESS. Understanding the Education of Students with Exceptionalities in WV. Working with Parents of a Child with Disabilities Perry C. Hanavan, Au.D. State of Connecticut Department of Education Department of Developmental Services PPT 101: Understanding the Basics of the Planning and Placement Team. Presented by: Diana Davis, M.Ed., L.D.T.C. IDEA AND ENGLISH LANGUAGE LEARNERS WITH DISABILITIES Office of General Counsel Division of Educational Equity August 15, 2012. Parent Academy Topic: Special Education Basics 1. “Special Education 101” Dr. Kaye Tindell Special Education Director. Improving Outcomes for Students with Disabilities Office of Exceptional Children Cathy Boshamer, Director John Payne, Team Lead November 7, 2013. Copyright (c) 2003 Allyn & Bacon Teaching Exceptional, Diverse and At- Risk Students in the General Education Classroom Third Edition Sharon Vaughn Candace. What School Nurses Need to Know Karen Erwin, RN, MSN Education School Nurse Consultant July, 2014. Laws and Family Rights. Why are federal laws important?  Empowers families to advocate for their children  Aids individuals with disabilities in decision. Transition Assessments About Transition Assessments How to find Transition Assessments How to give Transition Assessments Interactive Walkthrough.